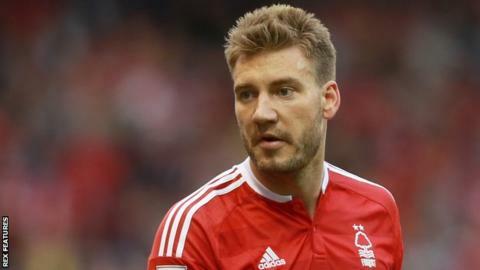 Nottingham Forest forward Nicklas Bendtner will not "go crazy" if he scores against Arsenal despite his time at the club being a distant memory. The 28-year-old will play Arsenal in a competitive fixture for the first time when Forest face the Gunners in the EFL Cup third round on Tuesday. "Most people don't celebrate when they score and some go absolutely crazy and start chaos, which is fun," he said. "For me out of respect I will celebrate a little bit, but it won't be crazy." Bendtner began his senior with Arsenal and spent nine years with the club, before moving to German side Wolfsburg in 2014. "[Arsenal] feels like a long time away. I had been there a long time but so much has happened since, so it's a little bit of a distant memory," he told BBC Radio Nottingham. "Things happen in football, it's a quick career and you have 15 or 20 years. "I was there at an early age and there's many things - ups and downs - that have happened but it's in the past and I only look to the future." The Denmark international says he has good memories of his time at Arsenal, but hopes his new club can progress to the fourth round of the EFL Cup for the first time since 2004-05. "I am sure I will probably pop into the dressing room after the match," he continued. "In 90 minutes when I go onto the pitch I am focused on Forest to win the match for them and after all the emotions it's a different story."